Tea originated in China, as legend has it, 5,000 years ago; yet it was Ceylon (now Sri Lanka) that made tea famous in the 19th and 20th Centuries, as the tea that was used by almost every major tea brand. Ceylon Tea is prized for its quality which is without parallel, and its variety which is unmatched for a small island boasting dramatically different teas in different parts of its tea growing regions. In assessing the value of Ceylon tea, some of the properties which tea experts take into consideration are appearance of the tea such as, colour of the infused leaf, as well as colour, strength, quality, aroma and flavour of the brewed liquor. The ultimate criterion of a ‘good quality’ tea is however the subjective assessment of expert professional tea tasters. Major brands have abandoned the traditional, centuries’ old method of making tea for a new “fast track” process which sacrifices the character & taste of real tea. 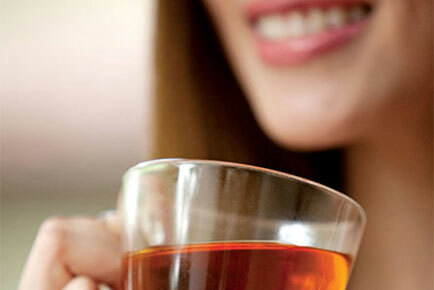 Dilmah remains faithful to traditional, authentic tea. That’s why Dilmah tea tastes so different. The EU Surveillance Reports confirm Sri Lankan teas as the cleanest with regard to pesticides and other chemicals generally present in tea. International Organisation for Standards (ISO) declared Sri Lankan Tea as the cleanest, as far as pesticide residues are concerned in 1997. This was re-confirmed in 1999. All pesticides and herbicides entering Sri Lanka have to be certified by the Registrar of Pesticides. Organo-chlorines are banned in Sri Lanka and Sri Lanka does not manufacture pesticides. The Tea Research Institute checks representative samples of teas exported and most of our Tea Factories are HACCP Certified. Stringent checks are in place to eliminate dust, grit and sand in manufacture which are very expensive. 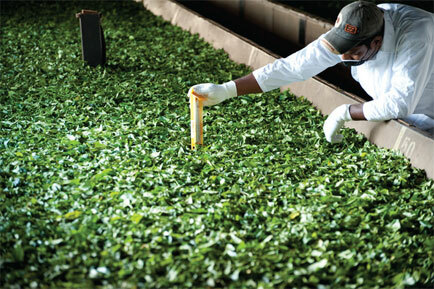 Colorimeters are in place to remove fibre (stems) in the made tea. Why do two teas, produced in different parts of the world, or in different elevations taste different, even if the processing were identical? Borrowed from the French, ‘terroir’ (pronounced tear-wah) perhaps sums up why no two teas are alike. Tea, just like wine, is dependent on its terroir. The natural alchemy of earth, wind, rain and warmth comes together to give tea its own unique personality based on its place of origin. This is the wonder of tea; the reason why one plant, depending on where it is grown and how it is processed, has the ability to yield this limitless variety. The Sri Lankan tea country is as vivid as it is stunning. It sprawls over the gently undulating hills of the Central Highlands at elevations above 6,000 feet; where the tea covered mountain tops lay hidden in a cloud cap, right down to the hot and humid lowlands bordering Southern Plains astir with warm breezes of the Indian Ocean. 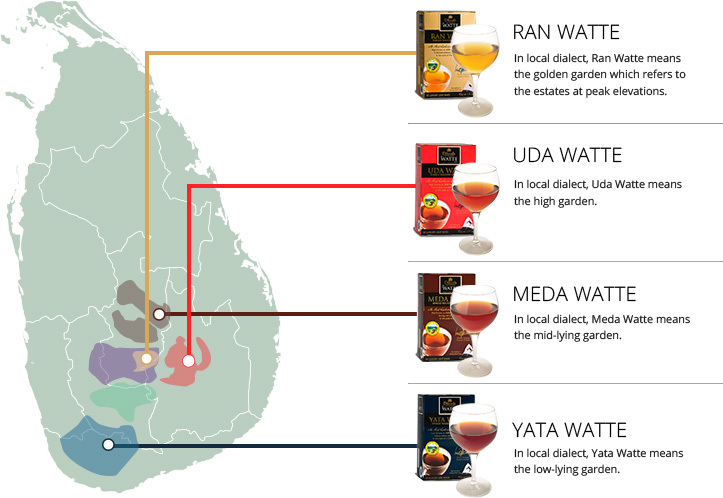 There are 4 tea growing regions in Sri Lanka, categorised based on elevation. In local dialect, Ran Watte means the golden garden which refers to the estates at peak elevations. In local dialect, Uda Watte means the high garden. 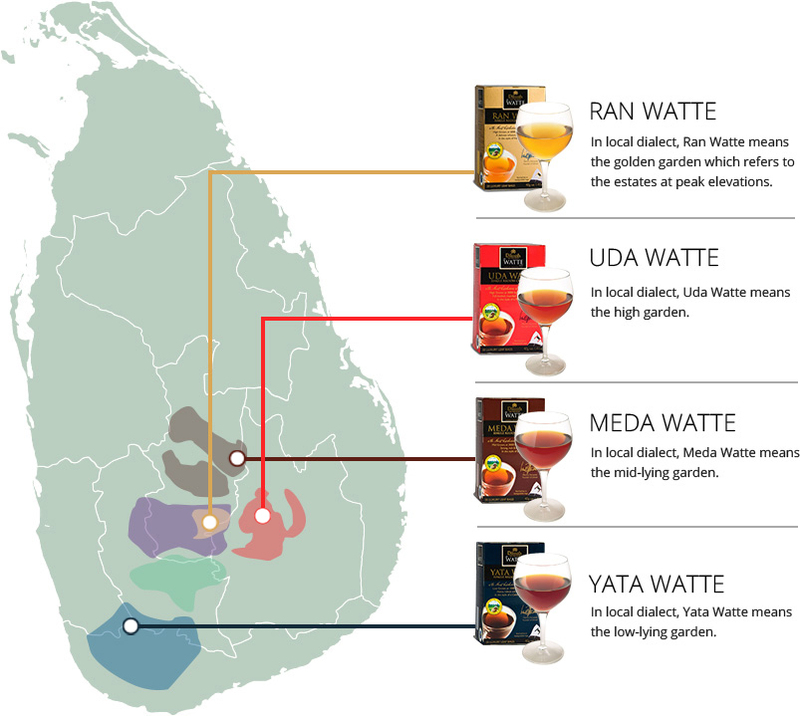 In local dialect, Meda Watte means the mid-lying garden. In local dialect, Yata Watte means the low-lying garden.